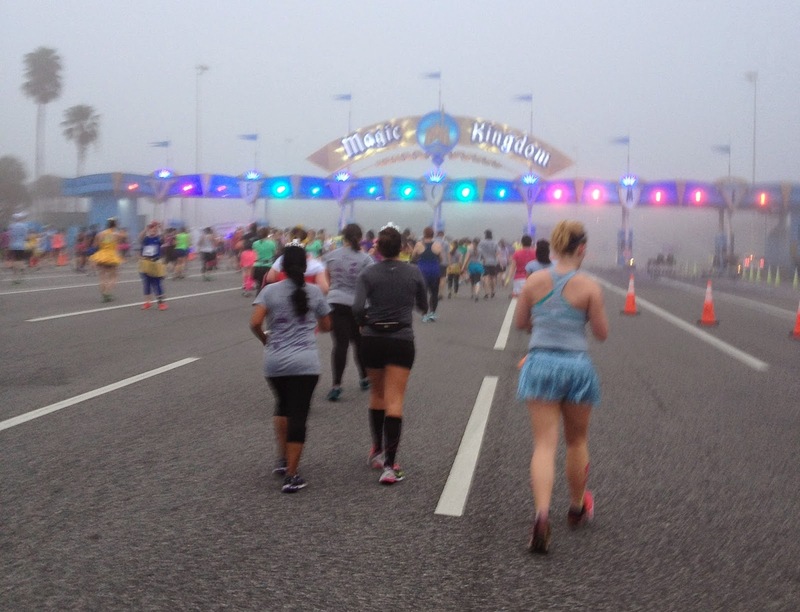 Connect the Dots Ginger | Becky Allen: Disney Princess 1/2 Marathon Sign Up TODAY! Who's signing up for the 1/2 marathon today??? Not I, said this ginger! Not this coming year at least. I will run it again, at some point but not this coming year. Why you ask? Well, I would love to run in the Disney Wine and Dine 1/2 in November of 2015 and Disney races are a little pricey and require me to save up some money. 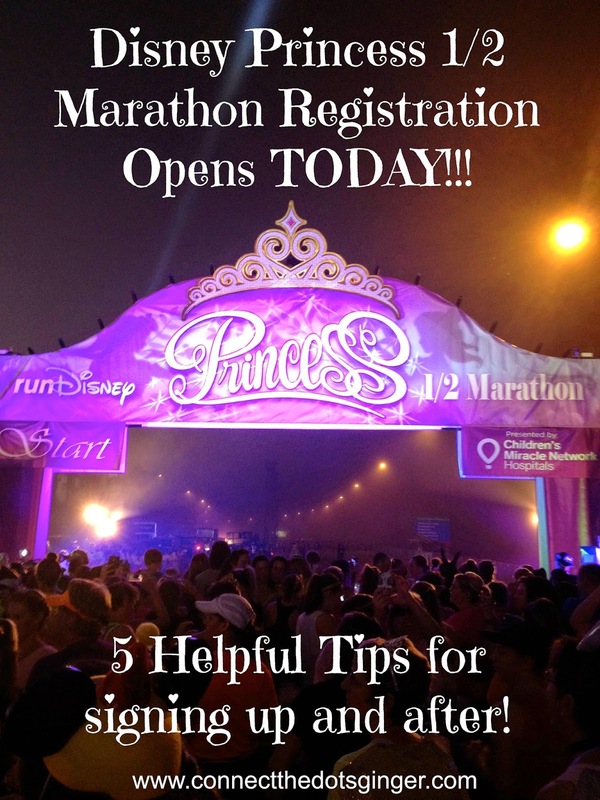 But for those of you who are going to be signing up today, here is some advice I would love to share with you! 1. Sign up early. IT WILL SELL OUT QUICKLY! This race is becoming more and more popular every year. The more people are doing it the more want to do it. So registration opens at 12 eastern. SET YOU ALARM! And sign up. 2. Pre-decide if you want to run the glass slipper challenge so that you are not sitting and waiting and deciding to do that or not. It is difficult! I was on the fence and decided as I was signing up that it would have been too much for me as it was my first 1/2 marathon. Glad that I didn't sign up for it since I was 29 weeks pregnant! 3. Once you sign up, start saving your money! The race itself is expensive but so is going to WDW! Hotel, the expo, and of course going to the park wearing your medal after you run the race. It adds up and take my advice, don't start saving for the trip in December. Start saving some money now! 4. Do not train for the 15 min/mile that they suggest if you plan on peeing during the race. Or taking pictures with characters. Just don't! Or hold it for the entire 3 hours and 30 minutes it will take to finish. If you are training at the 15 min/mile exactly know that there are natural choke points and you will have to slow down or walk to get through. (Like down main street or going through the castle.) Corrals A-C don't have to deal with this but if you are in Corrals L-O you better believe that yes you will have to slow down! It is just what it is. There are so many people and the bathroom lines and picture lines get so long that you are going to be strapped for time and watching you back for the sweepers. I was running a consistent 14:30 up until mile 10. I had 4 potty breaks. No pictures with characters. I had to walk the last 3 miles because my body was done. I came in over the time limit and everyone behind me was saying, "The sweepers were coming" When we hit the on ramp loop on the way to Epcot. That was the big fear, the sweepers! So decide now what pace you are going to train at and try to train at it and maybe just a hair faster! That's my 2 cents! 5. Have fun! This is a fun race. As hard as it was for me and as frustrated I was knowing that I was going to come in over the recommended time at just 3 miles in because the bathroom lines were so long, I still had an amazing time! It truly was magical. I will never forget the relief that I felt crossing that finish line with my best friend and knowing that I was done and I did it. Still kicking myself for not getting a decent pic of me wearing my finishers medal just after the race. Oh well, something for next time! But seriously, DO THIS RACE! At least once. IT is amazing to be surrounded by so many strong, and beautiful women (and some men too) running. Looking at our society with how many people are overweight, how many children are overweight and we had 24,000 women running in the race. And they weren't the same 24,000 from the previous year or the other years. Most of the women running are mothers, being a great example to their children of showing their dedication, effort and determination to run in a race that is physically and mentally challenging! Their children appreciate what their mother is doing, and along the way the child will learn that exercise can actually be fun and uplifting but hard work. It is getting our children to be more active when they see their parents being active. Live by example people! That is what we need to do! Hope you sign up! WELL WORTH IT! Well done RunDisney for providing such an amazing experience! CLICK HERE to go to the registration page! IF i told my hubby i was training for a run he' d pass out. This may be a way to get to Disney world again! If I hadn't been signed up for this half marathon before I got pregnant I would not have run during my pregnancy! It is a great excuse to get down to the parks but be prepared not to visit the park the day of the race! I RESTED the remainder of the day! Nope! I wanna do the Wine and Dine next year. Saving my $$ for that one! I will do it again, just not sure when!